Let's have a closer look at the number 1 holiday island in Europe. Mallorca is an open-air museum of cultural heritage dating all the way back to before the Bronze Ages. The island exhibits and manifests the many Spanish cultural eras in its architectural stylistics , the food and regions. Read this blog if you want to know about the secrets of this amazing island. To many people, Alcúdia, is synonym to crystal clear uncontaminated water, 14 km of silky soft beach line and unforgettable childhood holiday memories. Alcúdia is an amazing place; it is versatile, extensive and full of fun activities for all ages. However, what many tourists fail to experience, is the rich cultural heritage the old town of Alcúdia has to offer, which is a shame, because Alcúdia is like an open-air museum of important landmarks explaining the history and culture of the Mediterranean region. The name of Alcúdia comes from the Arab "al-cudia", and means "on the hill". Alcúdia was declared a historical place of interest in 1972, and you are about to see why. The overall attraction in Alcúdia, is the ruins of the Roman town called “Pollentia”. 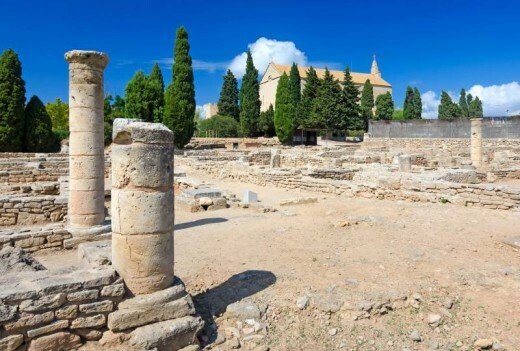 Pollentia was the first capital of Mallorca, it was established around 123 BC after the Roman army had finally conquered the island and beaten down the Carthaginians during the three Punic wars. Pollentia introduced a new way of living, an urbanization like the ones we know today. The excavations of this place was carried out during the 20th century, yet there is still more to discover. All artifacts found in this site are exhibited in the nearby historical museum of same name, well worth a visit. Some of the most interesting places inside the Pollentia area are; the necropolis, the theatre, the forum and the temples. Moreover, archaeologists have mapped out the main shopping street and civil homes of the city. Across the street from Pollentia, you will see a small chapel. This is the chapel of Santa Anna, and is the most well preserved church construction on Mallorca, dating back from the 13th century. Sa Bassa Blanca, is one of the most stunning examples of mixed architecture from the Mediterranean region. The building was designed by Egyptian architect, Hassan Fathy, who mixed stylistics from Andalusia, North Africa and the Basque country. Sa Bassa Blanca, is situated in one of the most privileged locations in all of Alcúdia directly on the slopes overlooking the amazing bay of Alcúdia, on the peninsula of Alcanada. Inside Sa Bassa Blanca, you will find one of the island's most sought for art exhibitions, the Yannick & Ben Jakober foundation. The art museum is established by Vietnamese Yannick Vu and Austrian Ben Jakober, a couple who have received numerous awards for their own works. The overall artistic shrine, is the exhibition hall called "SoKraTES", which is an old water depot transformed to an exhibition hall decorated with diamonds. The museum also include a famous collection of portrait paintings of children of noble and royal families from the late Middle Ages. In the gardens surrounding this majestic building, you can stroll around between the extensive park of animal sculptures made by Yannick Vu. Sa Bassa Blanca is probably the only art space on Mallorca suitable for children, and a must see sight for any cultural ambassador. t published — only you can see it. To publish, please Edit and use the Publish Now button. Torre Major is one of the most well-preserved defense towers dating from the 16th century. In the beginning of the 1500's, the Ottoman kingdom initiated a series of campaigns to conquer Mallorca from Spain due to its important strategic location in the Mediterranean region. The Ottoman naval army allied with pirates from North Africa, in order to attack Mallorca from several coastlines. To fight these vicious pirates, a network of watchtowers was erected on the coastlines around Mallorca. These watchtowers, communicated with each other by using smoke signals to alarm when a hostile ship was spotted. Torre Major, communicated with the massive fortified gates in Alcúdia old town. Whenever a pirate ship was spotted, the guards with send smoke signals and the army could be prepared for battle. The tower is situated on the peninsula of Alcanada, just in the corner overlooking the harbour of Alcúdia. The most important landmark of Alcúdia, is the medieval town walls and the four gates opening to the town core. The town walls was built by king Jaume II, successor of king Jaume I, who conquered the island from the Moors, and finished in 1362 by Peter III of Aragon. The vulnerable location of the area, between the bays of Alcúdia and Pollenca, meant that frequent attacks from the seaside was a regular threat to the economy of this new town. The walls and gates formed 26 guarded towers, which made the town a regular fortress. A rising bridge accessed the gates, and in the towers above soldiers could throw rocks and boiling water down on unwanted trespassers. What’s more interesting, is the parish church of Sant Jaume that has been built into the town walls. As you stroll around the narrow streets of Alcúdia, you will notice the mixed architectural stylistics of the building facades. There’s the Arab district, the Baroque district and the special regionalist style of the tower of the city hall building. 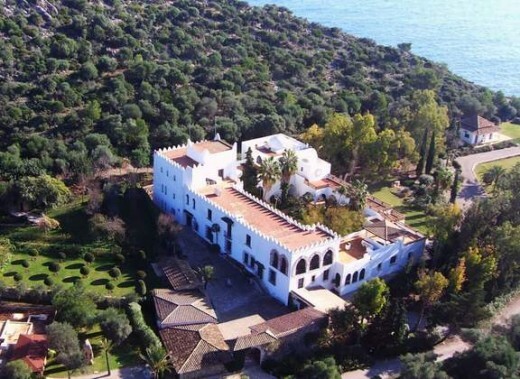 But Alcúdia is also home to former manor houses that belonged to intellectuals from Palma, who came here during the civil war of Mallorca (1521-1523). These houses, which carried Gothis stylistics, was transformed to Italian renaissance style decorated with adjoining columns, pilasters and heraldic coats of arms with plant, animal, ornamental and anthropomorphic motifs. In the Placa de Sant Charles, there is a beautiful sculpture of a Roman aguila (Eagle of the Roman legions), as a memory of the Roman occupation of this area. Home to more than 200 species of Mediterranean wildlife, the wetlands of s'Albufera is a must-see place of interest for any nature lover! s'Albufera, measures impressive 2,580 hectares of scenic vegetation and small lagoons made accessible via charming small paths and bridges allowing you to explore the nature close hold. s'Albufera is renown for its eels, which is a local delicacy up here in the northern areas of Mallorca. Ell, is the main ingredient in the pies called "Enseimadas", a delicious snack which is made with various vegetables. Before it was made a bullfighting arena, this circular construction was a bastion of the medieval town walls and overall defense system of Alcúdia. Bullfighting derives all the way back to the 13th century BC. It was originally a sacrifice to the gods, because the bull was synonym to fertility and power. Outside the village of Costitx in the heart of Mallorca, three bronze sculptures of bullheads was found in a prehistoric temple, as a an evidence of the bull as an animal of religious value. These three bullheads are now exhibited in the national museum of Spain in Madrid. I hope that I have given you some inputs and inspiration to visit and have a closer look at this amazing old town and area the next time you are here. Also, if you are going to Mallorca and want to know something specific about an area, please feel free to contact me! You can also have a look at my website, Acces Mallorca, where I help you discover the places of interest, sights and escapes on Mallorca. Mallorca is home to more than hundred different monasteries that has been occupied since the early Middle Ages. Most of these monasteries have been built on top of mountains and hills because back in the 1300's, it was believed that living in a higher altitude would save you from the plague and black death that harassed Europe at this time. The Lluc Monastery is by far the most popular and spectacular monastery on Mallorca. Actually, it is one of the most popular monasteries in the world. Thousands of pilgrims travel to Lluc every year by the old pilgrimage paths on Mallorca leading here. Lluc was founded in the 1500's, when a shepherd boy found a sculpture of the virgin Mary in a small cave in the mountain slopes. The boy brought this sculpture to the priest who put it in the local chapel for worship. However, the sculpture kept disappearing returning to its cave in the mountain slope, until the day that Lluc was founded and gave the sculpture a place to rest properly. Today, you can visit this sculpture, that is placed in a hidden chamber and decorated with a carpet of rubies. You will find the sculpture behind the main church inside the Lluc monastery. Lluc is also home to an exciting ethnological museum exhibiting artifacts, tools, furniture and art from Mallorca, all the way back from Roman times on the island (123 BC). Cura is situated at the summit of the mountain of Randa, in the area of Algaida east of Palma. The history of Cura has great importance to the Mallorcan people, because this place was the studies of the famous Catalan philosopher, Ramon Llull, who was the first man ever to write an entire book in the Catalan language. Llull was a preacher who was determined to convert heathens into believers and also owned and taught from his monastery of Miramar in Valldemossa. On a clear day, you can see all the way to the neighboring island of Ibiza from Santuari de Cura, a truly amazing sight. The old Charterhouse of Valldemossa offers a rich history to indulge in. The palace was originally built back in the 1300's , when it functioned as a hunting palace and summer residence for the king. Up through the Middle Ages, the palace was owned by the Carthusian monks, who owned it until the middle of the 1800's. The Real Cartuja became famous after the winter of 1838-39, when Polish componist Frederic Chopin and French writer, George Sand came to seek shelter here. The couple came to Mallorca because of the mild climate that they hoped to have a positive effect on Chopin’s illness (tuberculosis). However, the couple was thrown out of the monastery when the local congregation found out that the two was not married. Today, the Real Cartuja is home to the municipality museum of Valldemossa and the museum of Chopin and Sand, thus you will of course explore the old royal palace in depth. 4. 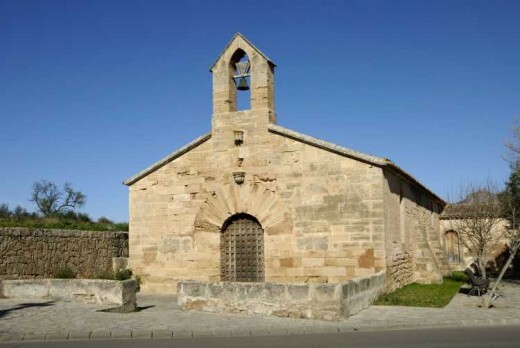 Santuari de Sant Salvador. The Sant Salvador monastery is situated at the summit of a mountain outside the town of Felanitx on the eastern part of Mallorca. Sant Salvador is may not offer as much exciting history as many of the other monasteries, but still, it offers something very unique. Besides from the monastery itself, the Sant Salvador is renown for its amazing stone cross standing on an attached mountain top. The cross measures amazing 11 metres, and when the sun sets in the late afternoon the cross creates a beautiful shadow and silhouette. The Sant Salvador is absolutely a must-see sight on Mallorca. My name is Eugene, writer, digital designer and culture enthusiast. I seek to learn and understand and try to reflect on my findings.